Let’s celebrate! It’s National School Breakfast Week. What’s the big deal about breakfast? Breakfast in school creates positive impacts children’s learning, school attendance, behavior, and in their overall health, according to FRAC (Food Research Action Center). On Wednesday, the Food Bank of Delaware partnered with the Milford School District in observation of National School Breakfast Week, March 7-11, by serving breakfast, of course. 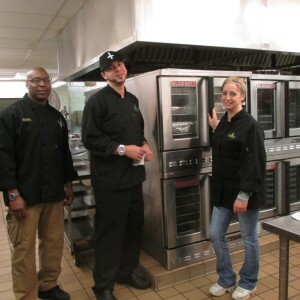 Tim Hunter, our Executive Chef, assisted by Ellen Roland, program manager at our Culinary School in Milford, and Zach, one of our TCS students, went to the school to serve a hearty breakfast to about 200 students this morning. In addition to the Food Bank team and the school’s enthusiastic and hard-working child nutrition staff, Sharon Forrest, the district’s child nutrition supervisor, and Karen Giery, a state Department of Education field agent for school nutrition, were also on hand. So what was for breakfast? Chef Tim prepared something a little different: breakfast burritos, both with turkey sausage and vegetarian, complemented by home-made, fresh salsa on the side. Most students, like Jamere and Emanuel, said they enjoyed the burrito. Breakfast, like most meals in schools, is pretty quick, at least by adult standards. It’s served at 7:15 a.m., and the bell for classes rings at 7:35 each morning. That’s 20 minutes, at most. In Milford, “breakfast is universal,” said Forrest, meaning that all students have the same opportunity to eat breakfast at no cost. Adults (teachers and staff) are able to buy breakfast if they choose. She said high school students, particularly, prefer a “grab ‘n go” breakfast model, and she hopes to eventually acquire a lobby kiosk to better serve them. Watching the students file through the line and find seats in the crowded cafeteria, Giery was pleased with the participation. The problem, she explained, is getting them to eat breakfast. Some students decide not to, even if the food is free and available. “High school students are the hardest sell,” Giery said. At the checkout, meals are counted each day so the food service staff can record which choices are the most popular and also which aren’t. Sandy Passwaters, this cafeteria’s manager, said the menu goes through a two-week rotation. Students like the mac sticks and cinnamon rolls, but French toast is also a favorite. “They really like fresh fruit,” she added, noting that provides an opportunity to offer students something new. 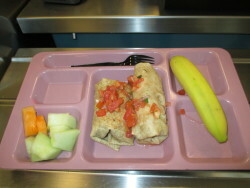 So Chef Tim’s breakfast burritos, filled with black beans, green pepper, red onion, egg, and cheese, might not have been something completely new to these students, but it was indeed something different for breakfast. “I thought it was a great opportunity for the kids to try something new, fresh food, fresh herbs in the salsa. I noticed very, very little waste. This is something I hope to do more of. I’d like to do more with the schools,” he said. And these students all seemed to enjoy the tasty start to another school day.